While on assignments or vacations abroad, I have met some OFWs. It always is depressing and enraging to learn of realities under which our OFWs labor. For example, in Kuwait after the first Gulf War, I have seen and heard how badly the non-professionals, i.e. non-engineers, were being treated by their employers. A humiliating treatment for OFWs in the Middle East is experienced when it comes to flying out/into Kuwait: Filipinos holding Philippine passports were not allowed to leave the Dubai airport for an overnight sleep in a hotel (which is part of the fare); and thus have to sleep on the chairs/floors of the airport. In Spain two years ago, I had conversations with fellow Filipinos, admittedly domestic workers, who have worked for 18+ years and still not able to save enough for themselves; their unhappiness show in their faces and in the way they speak. Even fellow Asians, as in one instance I spent 6 hours talking with five Malaysian student-scholars while on a train to Sevilla, were wondering why the Philippine government has neglected and taken for granted the native Filipinos. I was reminded that after gaining their independence in 1957 from the British, the Malaysian Party UMNO acted to reduce the landholding class through agrarian or land reform, then implemented in 1971 a national economic plan (NEP) to alleviate the poverty, redistribute income/wealth and increase the participation of the Malay majority in commercial activities. I wonder whether similar fundamental/radical changes can ever happen, that is, peacefully -- given the semi-feudal realities-- in our homeland. As recent as two months ago; in Italy the story is the same. 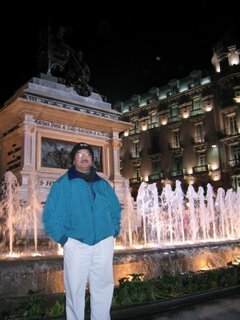 After 20+ years, Filipino OFWs still are treated as foreign contract workers and earning Italian citizenship is quite remote (however, a Filipino Salesian priest/family-friend, who have ministered to Filipinos in Italy for over 10 years, told me that among Europeans, it is the Italians who best treated Filipinos). The OFWs said that Filipinos as domestic workers in Italy (and elsewhere in Europe) are beginining to have competition from Eastern Europeans, who accept 5-6 Euros per hour. These sad realities under which our OFWs labor were part of the legacies started by the Marcos Dictatorship and continued by all his successors to the present. Our rulers have used the ordinary citizenry to solve the economic problems they --the native political elite (mainly composed of the landed oligarchy, joined in by former Marcos cronies,government bureaucrats and technocrats) in cahoots with foreigners such as the local Chinese and American businessmen-- created to afford/continue their plunder of the government (aka peoples') coffers, the exploitation of the national patrimony by foreign multinationals and their neglect of the native majority. If we had only nationalist leadership in government, we can easily see, per BSP statistics, that we do not have to "open up the economy" -- as these traitorous technocrats drum up into the Filipino ear -- since the OFW remittances greatly exceed any supposedly foreign direct or indirect investments. And it makes us wonder how long our OFWs will have to sacrifice their families--and unintentionally create the resultant and ignored societal problem due to absentee parents, to work and prop up the overall non-productive Philippine economy; and how long will our native majority, with their ignorance of "what's really going on," unknowingly allow their misery to worsen and continue for the next generations. With the many ongoing assasinations of political activists, journalists, peasants and workers, and clerics who want to inform/educate the ignorant Filipino native majority, it is clear that the native rulers and their foreign partners want to maintain the status quo, that is , "what's going on." Hereunder are two recent articles about our OFWs, and the stories are quite different: a good and a bad one. The former, about Filipino OFWs in England; the latter, in HongKong. There were other past postings about OFWs. Click to see them in: OFW remittances and OFW nannies. Technically speaking, Cambridge could be the most diverse place in Britain. It is a small city whose famous university attracts large numbers of people from around the world. And yet it remains very English, scarcely marked by its exotic but transient population - except at noon on Sundays. Then, in the suburb of Cherry Hinton, the St Philip Howard Catholic church throngs like downtown Manila. Each year, the Philippines trains a surplus of professionals, especially nurses, to take work overseas. Traditionally, these jobs have been in the US or Middle East, but when the NHS suddenly found itself feeling flush, Britain was added to the list. As a result, small Filipino communities now cluster around hospitals all over the country. The Cambridge group is probably the largest in Britain, thanks to the enthusiastic recruiting of Addenbrooke's hospital, a vast complex in the south of the city that now employs 513 Filipino nurses. A further 3,000 or so work elsewhere in the county. It is Philippine Independence Day, and the church and the lawn outside are packed for a special Sunday celebration. The hospital's Filipino choir will be singing hymns in Tagalog during the service, and a group of Filipino men will be invested as Knights of St Columba. Afterwards there is to be a bring-and-buy sale of Filipino food, followed by bingo. The day before was the Cambridge Filipino basketball tournament, and plans are already under way for the Filipino Community in Cambridge's Christmas party and for the Miss Little Philippines Cambridge beauty pageant. It would be fair to say that this is a very active community. Few are more active that Honey Catherine who has begun dancing before mass. "I like dancing," she explains. Honey's mother, Maria, is a nurse at Addenbrooke's. She left a job in Singapore to come here and is glad she did. "I like the weather," she says. "In the Philippines it's hot and sticky, and she's a very cold-blooded baby. It's better pay-wise, too, and the people here are very good, unlike in Singapore ... Don't ask," she adds, seeing that I am about to. After the service, Noel Cruz dashes past. He is a junior charge nurse at the hospital's transplant unit and today's master of ceremonies. "The government of the UK gave us a golden opportunity," he says,"equal job placement, equal job opportunity, and treating us like an ambassador of goodwill. In America, they see you as a contract worker. They would not give you an opportunity." And then he is whisked away again. Outside, while their parents prepare the food, excited children of all ages are swirling about the grass. If today's gathering is a fair sample - featuring dozens of pregnant women, about four hundredweight of babies and not a single pensioner - the average age of a Cambridge Filipino must be about eight. England T-shirts, of various kinds, are popular with all ages. By now, the feast has begun. There is a whole roast pig, pieces of which are being rapidly sliced, weighed and sold. There are noodles and spring rolls, black puddings and white ones. At one of the tables, Esther Bravo is selling ginataang halo-halo (translation: "milk with mix-mix"), a classic Filipino dish of tapioca, banana, plantain, sweet potato and coconut that hovers ambiguously between a main course and a pudding. Is it traditional for the occasion? "Not really," says Bravo. "Back home we don't usually celebrate Independence Day." Gradually, from within the hubbub, a chanted countdown coalesces. Noel Cruz is leading it from the pulpit. "Three ... Two ... One!" "Game ka na ba?" shouts Cruz. "Game Na!" the room replies in unison. The words ("Are you ready to play the game?" "We're ready to play the game!") come from a famous Philippine gameshow. Think "Nice to see you! To see you, nice!" Quickly, Cruz explains the rules and begins calling numbers, in English, with epithets. "Twenty-five! It's Christmas time!" "Age of puberty! It's 15!" "Sixty-nine! Paborito ng mag-asawa!" The grown-ups giggle lewdly at this last one. One of them finally agrees to translate. "Sixty-nine! A favourite of couples." Involuntary shrieks of tension greet each new call. When the winner approaches to have his card checked, Cruz can barely keep a grip on the situation. But something is wrong. The scrutineers hand his card to Cruz. "No," he announces, elated, "it's a false bingo alarm!" Pandemonium. "Game ka na ba?" "Game na!". When I first met her, in Hong Kong in 1994, Cathy was 19 years old. As she told me her story in the shade next to St John's Cathedral, her naive and cheerful demeanour belied the difficulties she had experienced since leaving her home in the Philippines. Cathy is the youngest of six children, and her mother is a widow. She completed secondary school at 17. A promising student, she hoped to study management in college, and eventually to start a small business. But her mother could not afford the tuition, so Cathy decided to go to work as a "helper" in Hong Kong instead. She had to overcome her mother's resistance. "I explained to her that I wanted to go to college," Cathy told me. "If I can earn some money, I will finish one [two-year] contract and then I'll go back home and continue my studies." To avoid employment-agency expenses, Cathy asked her sister, who had already worked in Hong Kong for six years, to help her find an employer. A friend of her sister's recommended Ms Leung, a Cantonese woman in her late 30s, who ran a small textile business. Cathy was assured that Leung would be a good employer. She was single and lived alone in a small, middle-class flat. The workload, it seemed, would be reasonable. Cathy's sister met her at Kai Tak airport on the evening of her arrival in October 1992 and took her to her employer's house. Cathy was surprised to find that the "single" woman lived with her husband and daughter, but Leung kindly reassured Cathy that she would be treated as a "younger sister". As it happened, however, Cathy was required to work 16 hours a day, and to do "illegal work" outside of her employer's home. She was not paid the legal wage stipulated in her contract. As Cathy explained: "It's written in the contract 3-2 [HK$3,200]. But when I got to Hong Kong ... [Leung] said to me, 'Your salary is 2-3 [HK$2,300], but don't worry, I will just add [to it] if your performance is good until it reaches minimum [wage].' She promised me, so I expected her to respect that promise. But for six months, no. She didn't add to my salary. So she only gave me 2-3. But in fact I only received 2-1, because she opened a bank account for me but she did not give HK$200 every month. The account was in her name and my name - a joint account. [Now] my bankbook is with her so I cannot get my money. My bankbook - my documents - she took them all." When Cathy ate with the family, she was served last. Other times she was given leftovers and rarely had enough to eat. The family slept in air-conditioned quarters, but the room where Cathy slept, which also served as a storeroom, was sweltering hot in the summer and leaked when it rained. Cathy's work followed a rigid daily schedule, beginning before 7am and ending around 9pm. Her duties included washing, shopping, cooking, cleaning, and looking after two dogs. In addition to such "official" duties, she was also required to serve as a messenger and to clean Leung's mother's flat, her friend's flat and office, and her office. Even on her rest day - which was rotated each week, thus curtailing her ability to meet her sister and her friends - she was required to make breakfast, take the dogs out, and do many other household chores. Leung gave Cathy a detailed list of rules to follow. She was forbidden to wear makeup, nail varnish, or perfume; she could not wear dresses or skirts, only trousers. She was not permitted to use the phone, and Leung threatened to deduct HK$10 from her pay even for free local calls. Leung specified the days when Cathy could wash her hair, and she monitored the length of her showers. She was required to pay for broken dishes, and her use of hot water was strictly limited. Leung claimed the right to change Cathy's day off without notice and to dictate that Cathy be home by 9pm. All her work was to be finished before bed. After work, she "must turn off the light and sleep within one hour, at 10 o'clock". "The employee must not be misconduct himself [sic]. The term misconduct includes insolence, persistent laziness, immorality, dishonesty and drunkenness. Misconduct will justify summary dismissal if it directly interferes with the interest and business of the employer or the employee's ability to perform his services. And all the expenses, including the air ticket, doctor fees, application fee, everything paid for you in advance for coming to HK the employer shall have the right to claim back all the charges and deduct in your salary while you break the contract or found dishonesty at any time." In fact, under Hong Kong policies an employer does not have the right to reclaim expenses. Although many employers create rules and regulations that they present as "law", the official employment contract for a domestic worker recruited outside of Hong Kong is the only contract that is legally recognised. But these laws, which exist to protect foreign domestic workers, are very difficult to enforce. In some ways domestic workers are not so different from factory workers, who are also expected to abide by rules of conduct and dress, to follow timetables, and even to fulfill work quotas. But foreign domestic workers are far more vulnerable. Whereas large groups of factory workers work together for the same employer, working a set number of hours per day, usually under similar conditions to one another, domestic workers are isolated, both by virtue of being foreign and because they work in private homes. They normally live in the place where they work, which can make work time indistinguishable from time off. It is easy to see how the domestic worker can be exposed to abuse or exploitation. Jane, a Filipina mother in her mid-40s, has been a domestic worker in Hong Kong for 15 years. During one particular interview with prospective employers she was presented with a set of rules. Jane declined that job and went to another employer who seemed to be far less controlling. Employers' rules not only govern a domestic worker's behaviour and attitude but also control her use of time and the pace of her work. The Hong Kong Institute teaches that women should: "Learn to clock watch. Schedule [your] time and work ... During your free time, rest if you must, but be ready to answer the door or telephone. Sew clothes or other special chores like re-potting some plants and cleaning kitchen cupboards." The idea that domestic workers need to be taught the "value of time" and how to "budget time" takes one straight back to the capitalist discipline imposed on English workers in the 18th and 19th centuries. Many domestic workers are not permitted to write letters or take care of their own business on workdays, or during work hours, regardless of whether they have completed their duties. It is as though the employer has bought the domestic worker's labour power and time, not simply hired her to carry out specific tasks. According to the Asian Migrant Centre study, more than 75% of all domestic workers surveyed worked more than 14 hours a day; only about 3% of Filipinas worked fewer than 11 hours a day. Almost a third worked 16 to 17 hours a day, with 4% slaving for more than 18 hours a day. All these timetables, dress codes, restrictions on the use of space, excessive working hours, special eating arrangements, among other household rules and regulations, do not simply control a domestic worker's labour. More importantly, they also convey the employer's sense of the domestic worker's inferior position. Informal rules of this nature are first imposed within the private domain of the household; but they may also end up extending to the still more private domain of a domestic worker's body, personality, voice - even her emotions. Some, like Cathy and Jane, do not passively acquiesce to their employers' demands and instead devise ways to improve their situations and leave abusive, controlling employers for better ones. They, however, are the more fortunate ones. · You are not allowed to rest and lean on the parlour sofa or your employer's bed. · A maid must always be polite and greet the employer, his family members, relatives, visitors as soon as meeting them by saying: good morning, good day, good afternoon, good evening or good night (before going to bed), sir, madam etc. Don't forget to say thank you at appropriate times. · Do not use any nail polish on fingers and toes. Do not put on make-up, even when you are going out to do the family shopping. Your hair must be short and tidy. Do not wear tight trousers and low-cut T-shirts while you are working. Do not go to the parlour in pyjamas. · You will be required to sleep and attend the baby and elderly, even during night time. · Must take bath daily before going to bed. Handwash your own clothes separately from those of your employers and the children (especially the underwear), unless your employer allows you to wash your own clothes in the washing-machine together with theirs. · Use separate towels for different purposes, such as a) sweeping floor, b) cleaning furniture, c) cleaning dining table, d) washing oily dishes, e) washing cups, f) washing basin, g) washing toilet; you should use separate towel for each purpose. · Washing of car and caring for pets (eg dogs and cats) are part of your duties with no extra allowance. · You give a very bad impression to your employer if they see you chatting or laughing with your Filipino friends outside their house or down the street. Therefore, never gather with other Filipino maids near your living place, especially when you are bringing their kids down to the street to catch the school bus or going to the market. · Do not write any letters during your working days, do it on your holidays. I came across your profile and saw that your favorite books include those of Renato Constantino's. I remember that name as the author of one of the books we used in Political Science back in college. I'm just not sure if it was about Philippine history or Philippine politics. Just brings back the memories. Your blog makes a lot of sense. I'll link it with mine. Thanks! Thank you and I am glad to know that you like Renato Constantino's ideas. 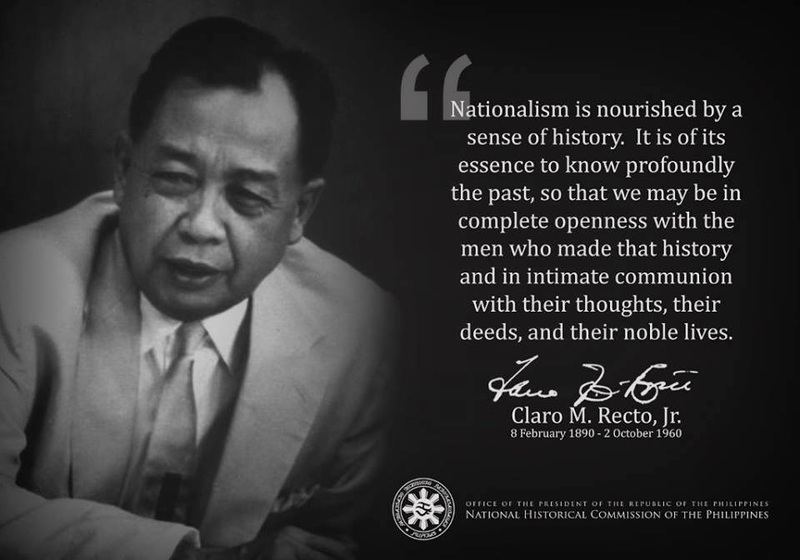 He is one truly great Filipino nationalist. It is sad that in our homeland, many schooled people have the 1950s McCarthyist mind, i.e. equating/seeing "red"(=communist) when someone talk of nationalism. These people expose themselves as having shallow knowledge/understanding of communism. Communism is against nationalism though it can use the latter like when Stalin used/drummed up Russian nationalism in its fight against the Germans, especially during the German siege of Stalingrad. But recent history in Vietnam and Cuba shows that nationalism is stronger than communism. And it is.